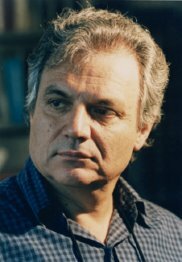 Theodore Antoniou, one of the most eminent and prolific contemporary artists, leads a distinguished career as composer, conductor, and professor of composition at Boston University. He studied violin, voice, and composition at the National Conservatory in Athens, with further studies in conducting and composition at the Hochschule für Musik in Munich, and the International Music Center in Darmstadt. After holding teaching positions at Stanford University, the University of Utah, and the Philadelphia Musical Academy, he became professor of composition at Boston University in 1978. As a conductor, Professor Antoniou has been engaged by several major orchestras and ensembles, such as the Boston Symphony Orchestra Chamber Players, the Radio Orchestras of Berlin and Paris, the Bavarian Radio Orchestra, the Tonhalle Orchestra (Zurich), the National Opera of Greece, and the Berkshire Music Center Orchestra. In 1974 he became assistant director of contemporary activities at Tanglewood, a position he held until 1985. An ardent proponent of new music, Professor Antoniou has founded various contemporary music ensembles, including ALEA II at Stanford University; ALEA III, in residence at Boston University; the Philadelphia New Music Group; and the Hellenic Group of Contemporary Music. He is also director of the ALEA III International Composition Competition, and since 1989 the president of the National Greek Composers' Association. Many of Professor Antoniou's compositions were commissioned by major orchestras around the world, and more than a hundred and fifty of his works have been published by G. Schirmer, Inc. & Associated Music Publishers, Inc. and Bärenreiter Verlag (Germany). He has received many awards and prizes, including the National Endowment for the Arts Fellowship grants and the Richard Strauss Prize, as well as commissions from the Fromm, Guggenheim, and Koussevitzky Foundations, and from the city of Munich for the 1972 Olympic Games. He has been recognized with ASCAP Awards for several years, and in 1991 he was awarded the Metcalf Award for Excellence in Teaching by Boston University. In December 1997 he was presented with the Music Award from the Greek Academy of Arts and Letters, one of the most prestigious awards and the highest academic distinction in music; and in January 2000, the Greek National Radio Broadcast Corporation awarded him the Dimitri Mitropoulos Award for his lifelong contribution to music. Theodore Antoniou's works are numerous and varied in nature, ranging from operas and choral works to chamber music, from film and theater music to solo instrumental pieces--his scores for theater and film music alone number more than a hundred and fifty compositions. One of his most successful works, the opera Bacchae, was given its first fully staged production for the Athens Festival in Greece. His newest opera, Oedipus at Colonus, commissioned by the Süd-West Rundfunk, Baden-Baden, in Germany, to be paired in programs with Stravinsky's Oedipus Rex, was premiered in Athens in May 1998; in August of the same year, the work received the prestigious Music Award presented annually by the Hellenic Union of Music and Theater Critics.